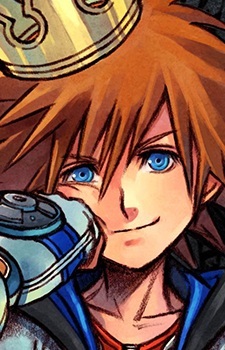 Sora is the protagonist of the Kingdom Hearts role-playing video game series. He is an upbeat and cheerful teenager and though he may seem simple-minded and naive at times, he possesses an unwavering heart and his strong sense of justice is extraordinary. At times, he is impulsive and quick to anger, but he is always sincere about what he says and does. He comes from Destiny Islands and is best friends with Riku and Kairi. He wields the weapon known as the keyblade which is a giant key that opens any lock. It also attracts beings known as Heartless and Nobodies. He is voiced by Haley Joel Osment in English and by Miyu Irino in Japanese.